Hallelujah, we have Internet access! This past week we've been having a ton of problems with our Internet provider, and while I'm not sure everything's fixed yet, at least we finally have access. It's true what they say, you don't know how much you depend on the Internet until it's taken away. Less time browsing Facebook and Pinterest has meant more time for crafting, though. 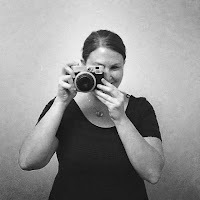 Among other things I reorganized the two closets that house my craft supplies, and this gave me the energy to finish off a couple of WIPs that have been hanging around in there for way too long. A great feeling! 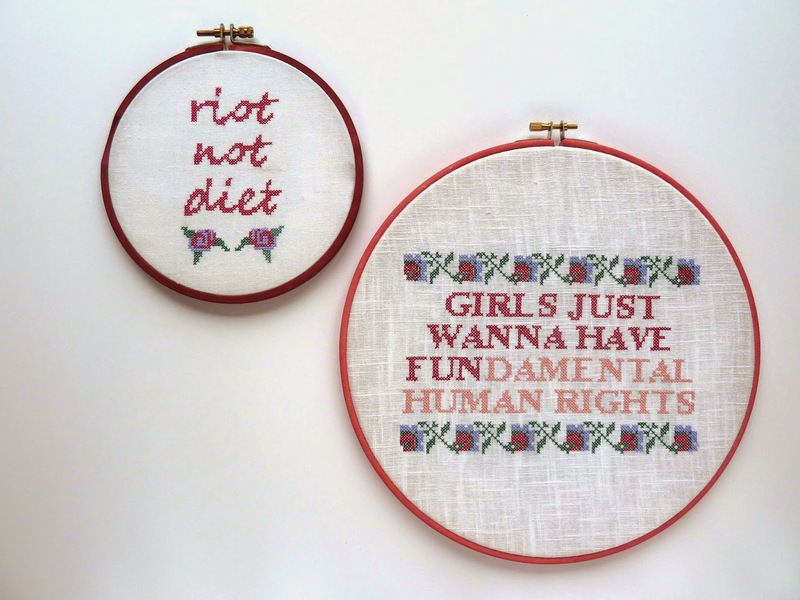 I am a big fan of the craftivism movement and sites like Subversive Cross Stitch. 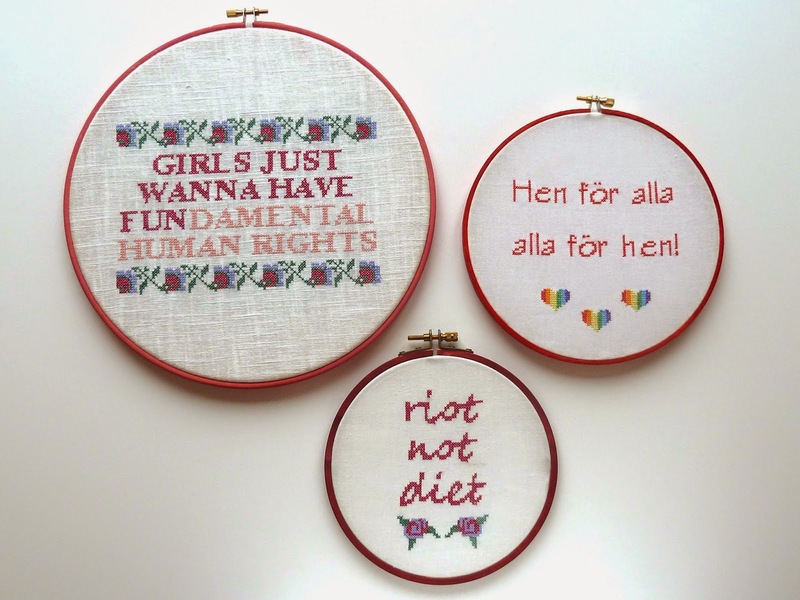 Ever since my mom got her Husqvarna Viking Designer Diamond sewing machine, I have been brainstorming ways to combine that subversive feel with the medium of machine embroidery. I'm not much of a cross stitcher myself (not enough patience!) so when mom introduced me to the cross stitch software that came with her Designer Diamond, I was understandably thrilled. I've spent many hours in her studio sewing and creating, but only this week did I get around to actually mounting the finished pieces. Here are a few of them! I mounted most of the pieces in embroidery hoops because that's what I had on hand, plus I like the look. 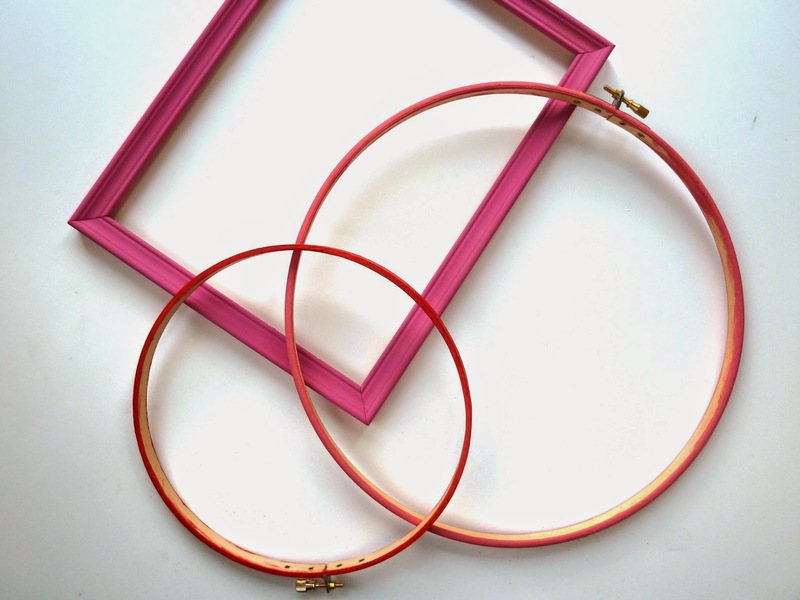 But I also had a couple of thrifted picture frames which worked well after a fresh coat of paint. 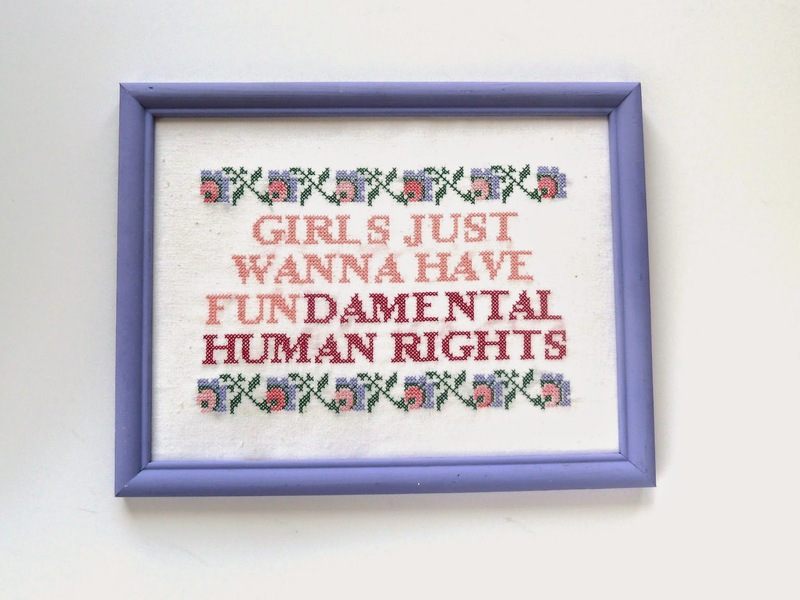 That pink frame now houses another "Girls Just Wanna Have Fundamental Human Rights" embroidery which is winging its way off to a friend to become a birthday present for her sister. That's part of the charm with machine embroidery - once you have a design programmed and ready to go, you can make several versions of the same design quickly and conveniently, experimenting with different color combinations, background fabrics, sizes and so on. The top picture in this post shows the same "Girls" embroidery on a really nice structured linen - I will be using that fabric again for sure! 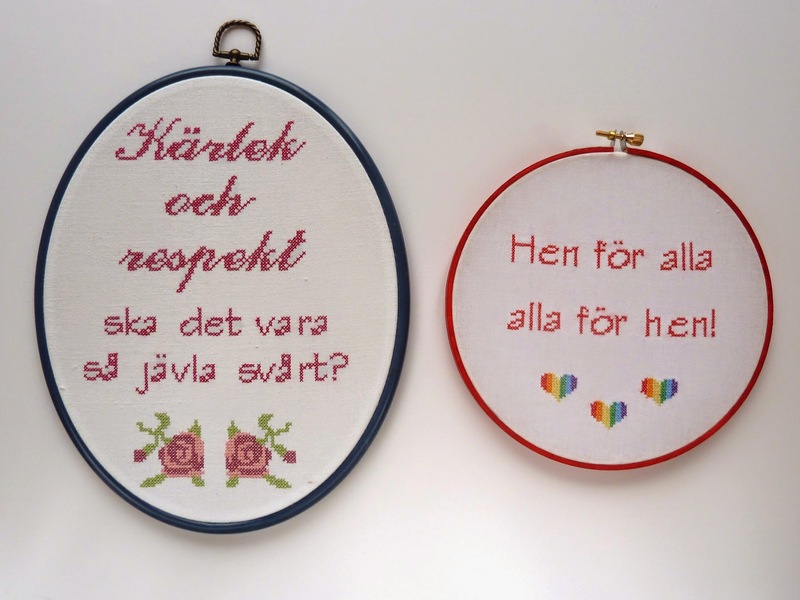 I also made a couple of hoops featuring "subversified" Swedish sayings. Not sure what I'll do with them yet, I might have to start a hoopla wall to feature them all. 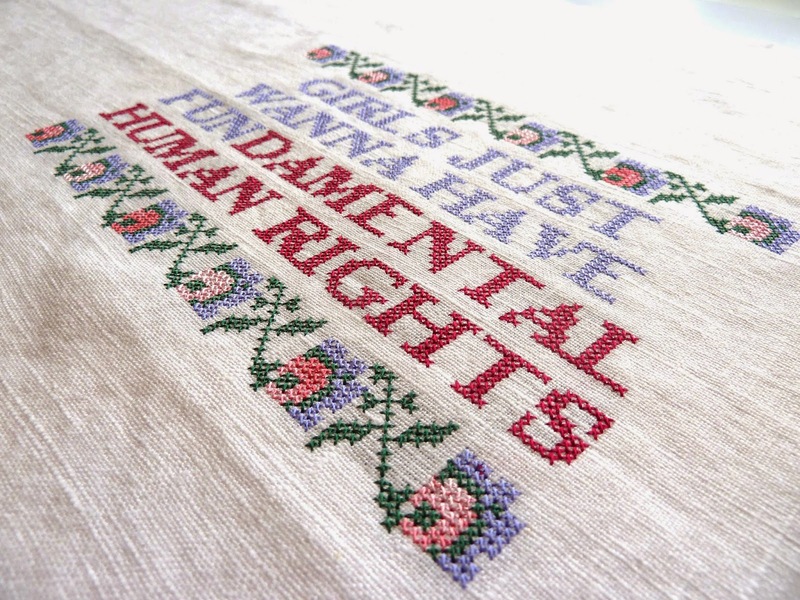 Right now my mind is reeling with ideas for more subversive machine embroidery, so I'm sure there will be more to come! Do you have any ideas for sayings, quotes, factoids or anything else you think would fit on a cross stitch wall hanging? I would love to hear your ideas! Hello. Are you selling these? Please say yes.